The Wing for Jewish Art and Life presents the religious and secular material culture of Jewish communities worldwide, spanning from the Middle Ages to the present day. Most of the objects on display were used by Jews from various parts of the world, such as North Africa, Central Asia, Europe and Israel. Their artistic styles, materials, and different uses reveal both similarities and differences among the traditions, and customs of the various Jewish communities. Thus, the collection depicts a vivid cultural tapestry, weaving together the individual and the communal; the sacred and the mundane; the heritage of the past together with the creative innovations of the present. This comparative display explores the objects’ history, and the social context in which they were used, while underscoring their aesthetic qualities and emotional resonance. Illuminating the Script. Rare illuminated Hebrew manuscripts from the Middle Ages and the Renaissance shed light on their artistic importance and their central role in the history of the Hebrew book. The Synagogue Route: Holiness and Beauty. Four interiors of synagogues from Europe, Asia and America, each characterized by its own architectural style and decoration, are displayed with Torah scroll ornaments and Torah arks from Jewish communities around the world. The Cycle of the Jewish Year. The sanctity of the Sabbath, and the traditional celebration of religious holidays, as well as the new commemoration of special days in the State of Israel, have given rise to a wealth of finely crafted objects and imaginative artworks. Costume and Jewelry: A Matter of Identity. Unique examples of Jewish dress and jewelry reflect Jewish identities from East and West, and influenced by the laws and customs of each individual local community. Infused with a sense of the holy, the synagogue is the focal point of Jewish life: the main place of communal worship and also often the scene of educational, social, and cultural activity. Whatever language the Jews spoke in their dispersion, they continued to read and write in Hebrew. The cycle of the Jewish year is arranged here according to festivals and other occasions that have similar contents and customs. 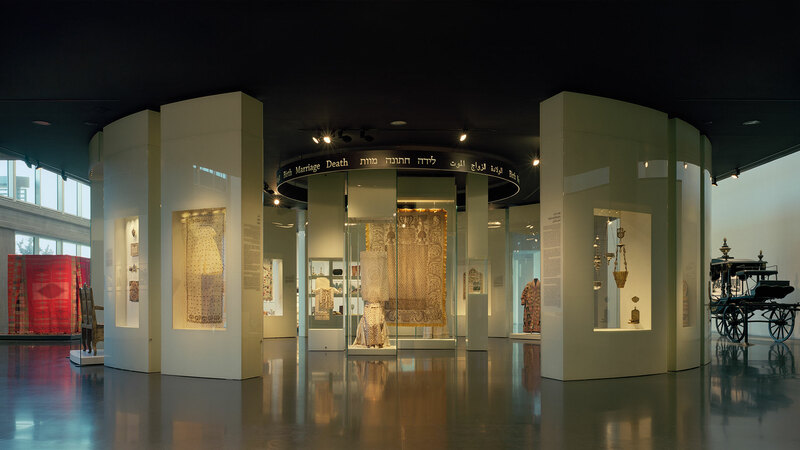 The Israel Museum collection of Jewish dress and jewelry is one of the richest and most extensive in the world.